Warm weather is finally in full swing here, and we have been outside enjoying the beautiful weather. My peas, carrots, onions and broccoli have all made an appearance in my garden, so I am hoping everything will continue to go smoothly on that front. 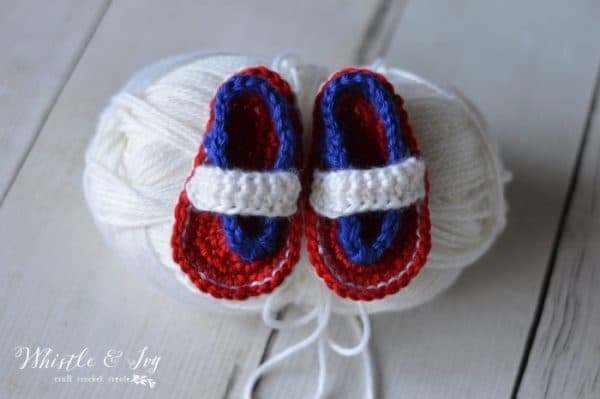 Last night I was looking at my yarn stash brainstorming patriotic ideas, and I thought of my Baby Strap Flip Flops. 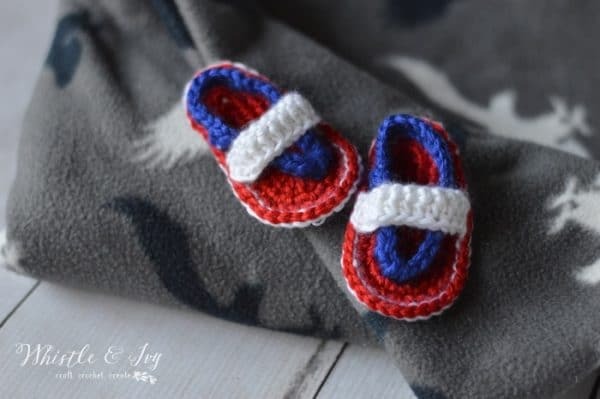 I thought maybe they would be cute in patriotic colors…and they are! Show off your American pride (or use your country’s colors!) with these Patriotic Baby Flip Flops. I haven’t made these flip flops in a while. I haven’t had too many babies born in my family, and we have had a very chilly spring here for my local friends with babies. That being said, when made these last night I made a change, and I will be updating my original flop flop pattern (and video) hopefully soon. When I am in the zone designing, my brain is targeting on designing only, and sometimes I can’t see the forest through the trees. The strap is needlessly complicated. These are size 3-6 months, and instead of doing the turning, and the sc down the side and having 2 tails on one side (yikes), I simply chained 11, sc in the 2nd chain, sc in each ch across, turned, ch 1, and hdc across again. This is so much simpler, and it leaves you with one simple tail on each end to sew it to the shoe with. Sometimes I can be super detail-oriented and it leads to overcomplicating things. Also, this is not a permanent change, but on the sole I worked the slip stitches from behind, so the straight stitching was on top and the two loops are on the bottom. 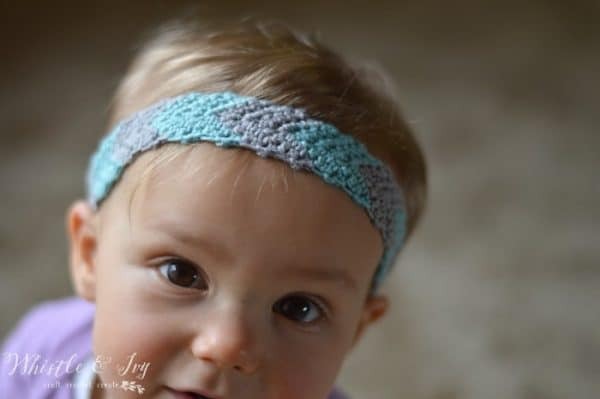 It changes the look a bit and I like it, however, the straight stitching is more challenging to crochet through so that is something to consider before you try it. 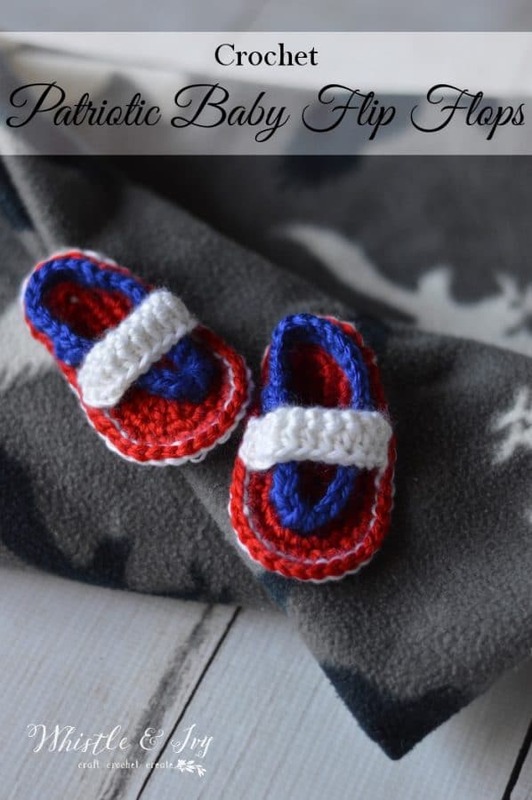 These Patriotic Baby Flip Flops are made with Knit Picks Mighty Stitch (<–affiliate link) in Serrano, Celestial and White. Get the Original Baby Strap Flip Flops here. Do you like this post? Subscribe! 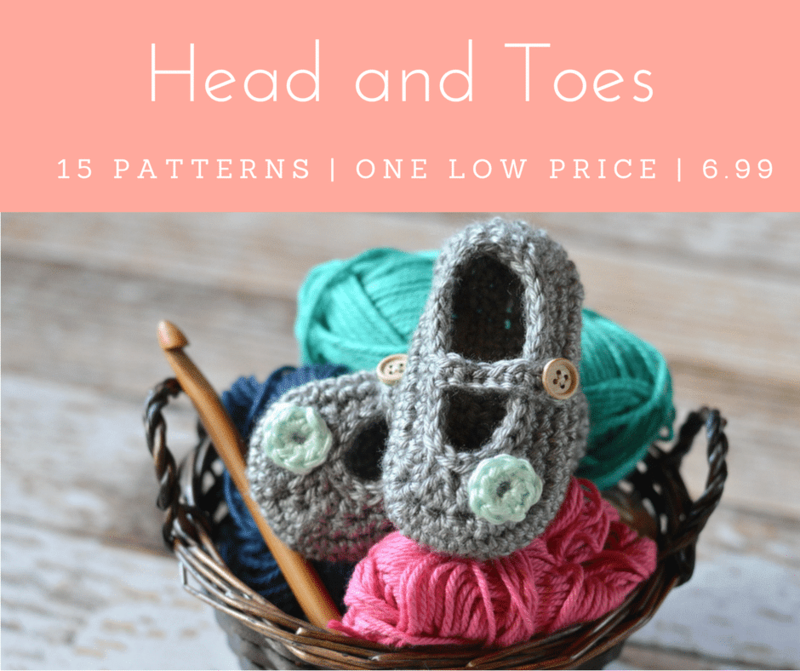 You might like these crochet patterns too! I can help you! 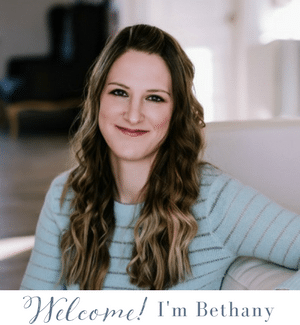 Use my contact form to email me your detailed question. These are so sweet, and perfect heading into summer! Thanks for linking up with Merry Monday. These are the most precious things! 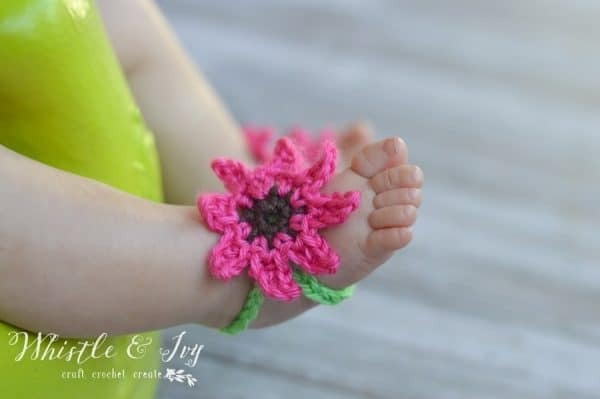 I have a 2 month old grand daughter, that I would LOVE to see these on! 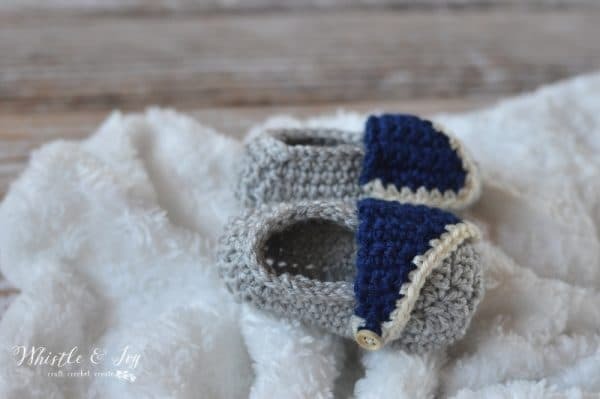 However, I don’t have the skill or patience to actually crochet them myself!! Thanks for following <3 Thank you!! I hope you like these! 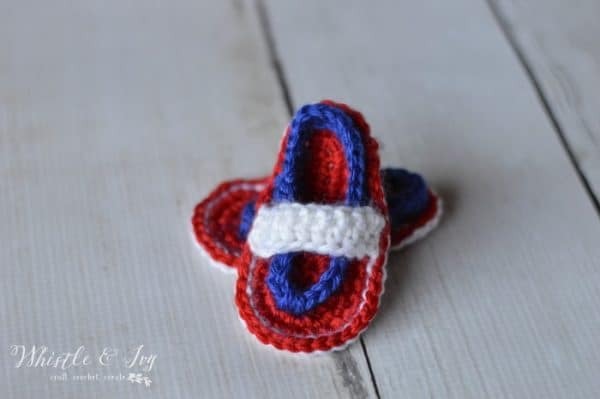 I’ve made two pair of red, white and blue sandals last year for great nephews with a “T” stitched on the tab (for Texas Rangers) and they are darling..don’t know how to attach photo, lol! Oh awesome!! You can put them on my Facebook wall or Tag me on Instagram (@whistleandivy), I would love to see them!